Ben says the RT90 Corona Coupe is ultra rare. However, I’ve found him about three to four examples floating on the lists of craig. This black-on-red ’72 is similar if not identical to the one owned by the Toyota USA Museum and boasts a documented 35,000-mile odometer. Like most, the 18R-C is paired with a Toyoglide three-speed auto. Though the wheels appear to be from a later Corolla, the owner assures speculators that the rest of the car is complete and a rust-free specimen from Phoenix. Buy it on craigslist for $6,000 and be twinsies with Toyota at the next TORC show. tagged: corona, coupe, kidney anyone, rt90, t90, toyota. I have to say that I didnt think they were rare either. Ive seen a handful on CL over the past year or so. Ive seen this particular example several times in my web hunts but never thaught much about posting about it. Although I am a toyota fan I think the Datsun 610 2dr is a much better looking car, especially with those triple taillights! I wish coupés/hard tops would become fashionable again. i wish vinyl roofs were never fashionable.. Same color, same year, both automatics. These cars should get together. Maybe they could meet halfway on I-10. Thanks on the GT. Noted. I hope everyone is in the best of health and spirit. 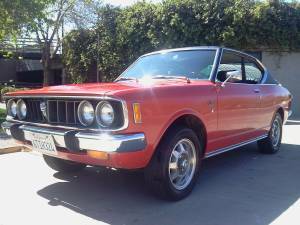 I am the owner of the 1972 Toyota Corona Deluxe and made the decision of keeping the car. I traded the car to a cousin of mine for a 1978 Malibu and $1500.00 definitely keeping her she is solid strong and perfect condition runner. I am not sure how to post pics, but I will try. Can I please get your suggestions on which wheels to buy for her? Thanks! Do some searches on this site about vintage Japanese racing wheels. There are many different models and sizes. Or come to JCCS or Toyotafest and take a look at other vintage Toyotas in person. Phoenix isn’t that far away!